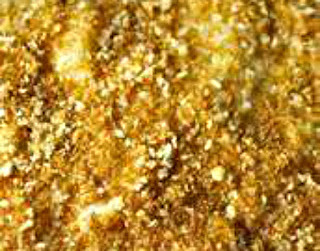 I have been trying with a minimum of success to share with you the recipes I made for the jewish holidays. I look at my photos and unfortunately, in some cases, I have no idea what they are. Kugels and casseroles have similar looks. I am guessing, this is a cabbage casserole but I am not sure. What I am sure of is that it was delicious and went quickly. I am finding more and more ways to make cabbage. It is a versatile vegetable and mixes with many other ingredients. Forget only using it for cole slaw. It is a multi-"talented" veggie. 1/2 teaspoon salt 1/4 teaspoon black pepper Method: Preheat oven to 325 degrees F. Spray with cooking oil a one quart casserole dish. Melt butter in large saucepan. Add cabbage and onion; cook over medium heat until softened, about 20 minutes. This week, Gaye chose Roasted Brussels Sprouts with Parmesan and Vincotto from the Donna Hay magazine, Jun/Jul 2015 on page 88. I have a few stores where I do my food shopping and it all depends on where I am at shopping time which one I go to. This week, I ended up in the smaller kosher store in the neighborhood and of course, they did not have brussels sprouts. Granted, this is not my favorite store and I usually walk out unhappy, I still like to support the ownership who are nice people who don't seem to be making a success of their venture. I had no time to travel to the bigger stores with the better produce so I put on my thinking cap and came up with a substitute which is a bit far fetched, broccoli. 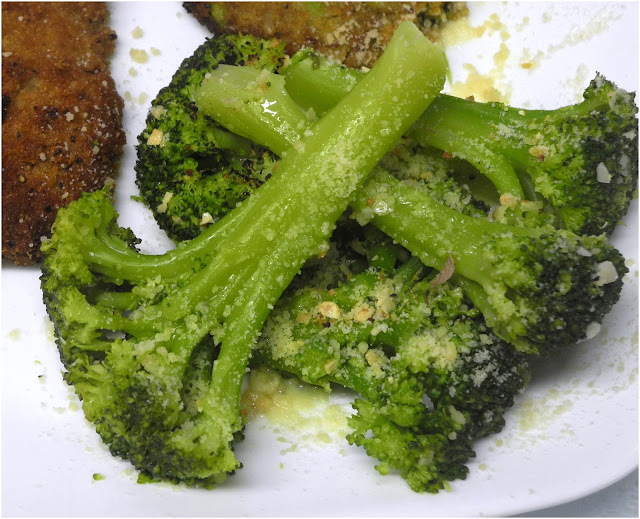 I can't vouch for the brussels sprouts but I will say, the broccoli was delicious with a taste of lemon, garlic, red chili, Parmesan and black pepper. Pulled together with olive oil, it made a delicious side. I make salmon, so often, it is easy to confuse my recipes. 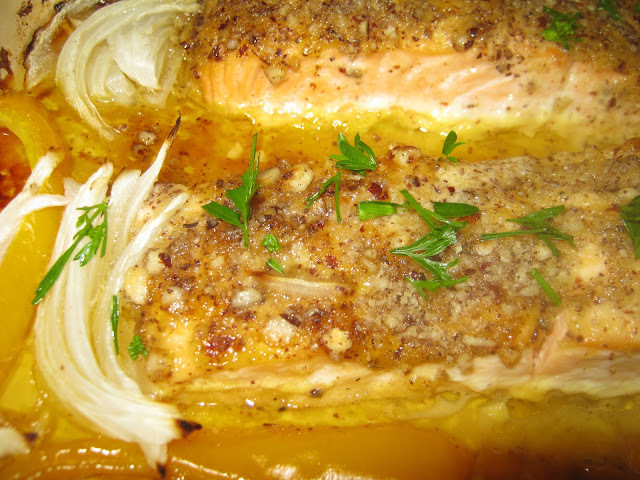 We love salmon so I admit, it is hard for us to consider almost any salmon recipe, a failure. Some are not particularly good looking but tasty, they are. This one, my guests also loved, so it is probably a winning recipe. It originated from Baked Dijon Salmon from allrecipes.com. I have been, recently, making lots of salmon with soy or Teriyaki sauce and as much as I love that, I wanted a real change. Honey and Mustard was the way to go. To me, a touch of sweetness is important for salmon. You can use brown sugar or agave, instead of the honey, if that is your choice. The idea is to have some sweetness. This was a successful recipe but as I said, it is difficult to go wrong with salmon in our house. I plan to make this several times over. Peggy selected a unique recipe, Mini Pumpkin Jar Cakes found on page 291 in Weeknight Wonders. This was easy or quick to make, and I used pumpkin pie spice in place of the various individual spices which made it even easier. I ate it hot out of the microwave and it was yummy. Check what the other members made at Eating with Ellie. This is a dessert week for the WwDH bakers. 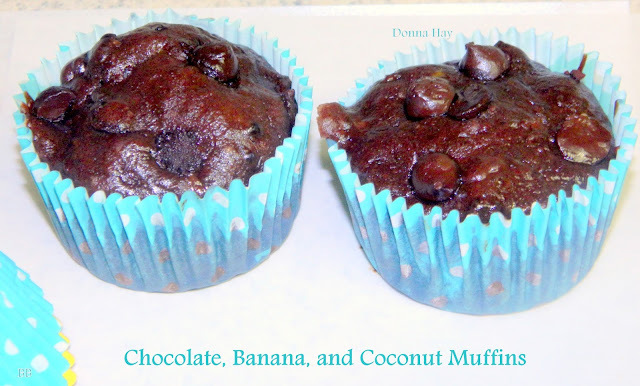 We made Chocolate, Banana, and Coconut Muffins. I skipped the coconut because my grandchildren were visiting and they don't like coconut. Instead, chocolate chips made a major difference to them. These were easy to make and my little granddaughter loves them. She took one bite and gave a sigh of satisfaction. The older grandkids enjoyed them as well. Hearth and Soul HopTuesday’s TableWhat'd You Do This Weekendsee their cupcakes. I am coming back to blogging slowly but surely. It is hard not to have this as a daily discipline and then expect to jump in full force. I couldn't do it. I think, once I get a few days posted in a row, I will pick up the volume and hopefully fill you in on some wonderful dishes, I made over the holidays. Something Sweetis the name of a recently published book by Miriam Pascal who has a blog, the Overtime Cook. I decided to use it for most of my holiday baking and it truly fit my needs. Miriam thinks like I do and prefers using oil to a less healthy margarine in many of her baked goods. The mousse, I made from the book, had no raw eggs, something I am diligent about not using. This week, I selected this recipe for EwE but I unfortunately did not post it in time for our weekly Thursday cooking. Better late than never definitely is proven because this turned out to be a fantastic side dish. 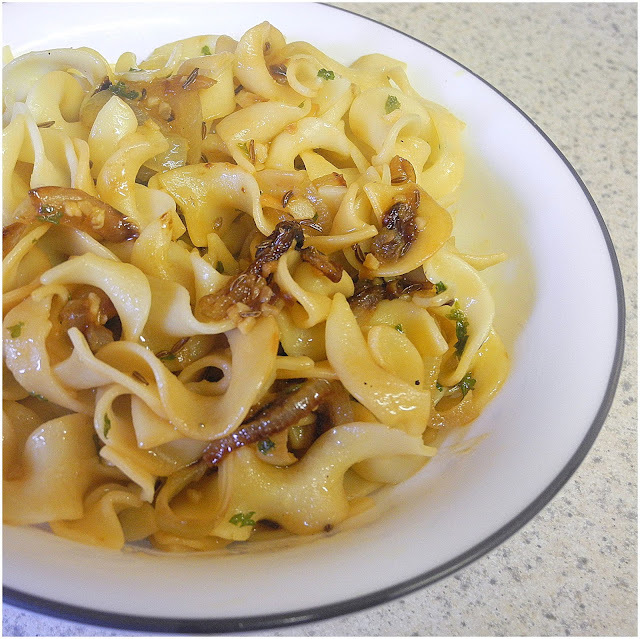 The noodle with caramelized onions, garlic, parsley and caraway seeds blended together for the right flavor and the right crunch. I recommend this recipe, Egg Noodles with Onions, Caraway, and Parsley from Weeknights Wonders by Ellie Krieger. 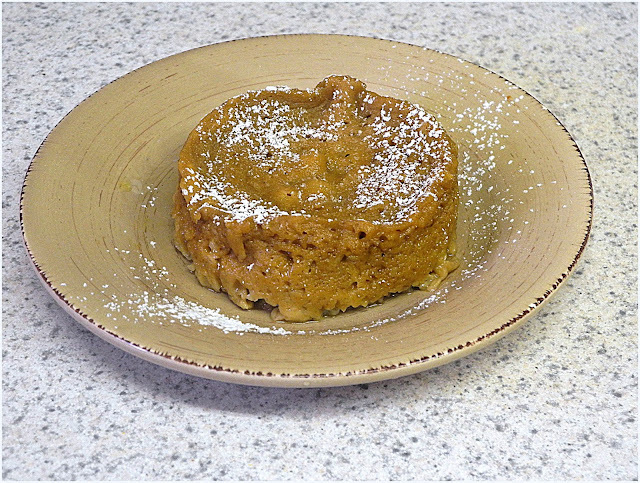 Check out our Eating with Ellie page to see what others have done with this recipe. I am recovering from the Jewish holidays and I am not really back blogging but I did bake this cake from Donna Hay for my company. I took some chocolate nutty candy and put it in the food processor and dropped it in globs on top of the cake. I also added some caramel chips to the batter. I figured this would appeal more to the children than a plain cake. The "Wednesdays with Donna Hay" group baked this, this week and I am taking bets, they found it as easy as I did to make. Peggy selected this and it is from Off the Shelf. Thanks Peg. To see what the others did with this recipe, check out our page .